Let’s set the scene, real quick. You are feeling fresh and ready to go when you get to the pool. Your favorite song is playing on the pool’s PA system. You’re even rocking new goggles (I can see clearly now…). During warm-up your stroke feels long and strong. Walls are crisp. Some promising glimpses of speed during the pre-set. But when the main set comes galloping around, and it’s time to hit the gas and start knocking out some race reps, it’s not there. The reps feel harder than you expected. Your stroke doesn’t feel so strong anymore. The catch feels sloppy. Legs dragging behind you, full of cement. After a couple attempts, and continuing to miss the pace your coach set for you, the frustration begins to boil over. The urge to space-shuttle launch your snorkel across the pool deck is looking mighty appealing. Is this a race pace you are attempting for the first time and have never done before? Nailing it the first time out might have been wishful thinking. You will need to embrace the notion that you are going to have train ugly at it for a little while before being successful at that new race pace. Taking a run at this pace may require more than one attempt. Perhaps three. Maybe five. Your job isn’t necessarily to hit the pace perfectly, but to do everything you can to prepare and execute at practice. The only guarantee should be your effort. It’s your job to keep showing up and hammering away at it. This is a simple idea, but very, very hard. 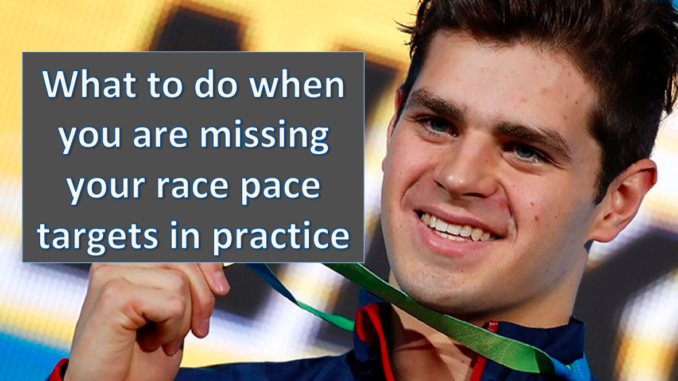 Most swimmers simply can’t stand the repeated failure that is required to improve this way. Failing five times before succeeding once doesn’t sound like a lot of fun. It crushes their ego and motivation and pushes them away from the countless opportunities of improvement that are available to them. Now, let’s say you are doing everything you can to show up and perform at your best. And you are still not hitting those race pace targets. Well, I’ve got an answer for that too. And it’s something you can apply to frustrating circumstances in the pool, no matter if it’s the first time you are trying to hit a particular race pace or the hundredth. Seek intra-challenges: Be better somewhere besides the clock. Okay, so you aren’t hitting your race pace. Now what? Coast through the rest of the set? Quit? Hit the launch button on that snorkel? Be better somewhere besides the clock. That’s what. While you have been fixated on that clock, you have ignored the dozens of other opportunities you have to become a better swimmer today. No matter what the clock says, you shouldn’t abandon the overall goal of the time you spend in the water. To become a better swimmer. And you can do this in other ways than hitting a specific race pace. The problem a lot of swimmers run into is that their motivation and thirst to improve are completely dependent on what the clock says. Swimming slow? Waste of my chlorinated time. What kind of way is this to train? To be at the mercy of the whims of your speed, which are influenced by a ton of things from how much sleep you got last night, what stage of the season you are in, to how hydrated you are. I understand the desire to measure the sets, reps and practices solely by the numbers on the clock. This is usually the only barometer that matters in competition, after all. But if you open up your focus to see all the other ways you can be improving today at practice, I promise that you will never run out of ways to become a better swimmer. If this isn’t making much sense, or sounds like a bit of jibberish (“What do you mean the clock isn’t the only thing that matters?”), let me break it down with an example. Let’s say the main set is 20x50s. Each rep is supposed to be completed at the same pace as your 200 goal time. But instead of hitting your target pace of :30, you are swimming :31s. Can you shave :05 off the interval and swim the same speed? Can you take an extra dolphin kick off the wall(s)? Can you take one or two less strokes and swim the same speed? Can you not breathe for the last 10m and execute a perfect race-finish each time around? Can you wear a slightly draggier swim suit to add some resistance? The ways you can tweak the difficulty are almost endless. Making it more difficult in other ways will make things feel “easier” when you go back to the original set. Doing the set on a harder interval will make the set feel easier when you go back to your regular interval. Adding a little resistance will make your stroke feel faster when you try the set again without resistance. You won’t be wasting your time at practice. Feeling like you wasted an opportunity to get better is annoying—and the feeling of performing badly can quickly infect future sets and practices. We only have a set number of workouts to improve over the course of the year. By always being on the hunt for improvement you are sculpting a faster and better performance from yourself. And oddly enough, letting go of the frustration from not hitting the desired pace may even help you relax and get back into a mental space where you can perform better. The elite-minded swimmer knows that the clock never tells the whole story, especially in practice. There will be sets where your feel for the water isn’t there, your speed isn’t where you want it, and things simply feel more struggley than usual. Doesn’t mean you should give up on the countless other opportunities you have in practice that day to become a better swimmer.